On the longest day of the year – summer solstice – Anchorage, Alaska, gets 22 hours of functional daylight, and the city makes the most of all that sun. Alaskans gather for big celebrations, classic events and a huge dose of outdoor fun on the days surrounding solstice. 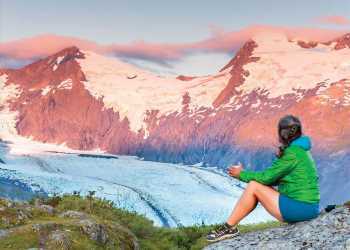 From hiking and biking to concerts and festivals timed to take full advantage of all the rays, summer is in full swing under the midnight sun. Downtown turns into one big celebration on June 22, 2019, with the Solstice Festival & Hero Games, an Anchorage Downtown Partnership, Ltd. Production, taking over Fourth Avenue and Town Square. Artists, musicians and other performers transform Fourth Avenue into a party. The Children’s Rainbow Factory, which includes puppet shows, a kayak pool, and giant sandbox, just to name a few! Nearby, the city’s firefighters, police and military units test their mettle in skills competitions at the Hero Games. Events like a stretcher carry race and ladder rescue mirror the jobs of a first responder. Out on Anchorage’s trail system, one of Alaska’s most popular running races hits full stride. The Anchorage Mayor’s Marathon & Half Marathon puts runners on some of Anchorage’s best trails. With a five-miler, half marathon, marathon and marathon relay, the race has great views. Runners often spot moose or other Alaska wildlife along the course. Solstice fun on the trails isn’t limited to the fleet footed; Flattop Mountain is great for hikers of all abilities. Stunning views of the city and surrounding mountain ranges make the hike popular all summer, but solstice is a special time on Flattop. Many hikers hold informal parties at the summit or even set up overnight camp. Concerts are a big draw on the sunny summer solstice. Moose’s Tooth Pub & Pizzeria, Chilkoot Charlie’s and Humpy&apos;s are working on summer lineups which always have something for all types of music lovers. And if you miss the solstice beat but still want a little music during your visit, Anchorage Downtown Partnership organizes a concert series that runs all summer long in Peratrovich Park. Anglers hoping to reel in a monster salmon under the midnight sun cast their lines just steps from downtown streets. Ship Creek hosts the Slam’n Salm’n Derby. Netting great prizes doesn’t take a master angler during this derby; reel in the biggest king salmon or hook a special tagged fish to win cash or new gear. For a seventh inning stretch well after 7 at night, there is no place like Alaska; the Anchorage Glacier Pilots have a summer baseball schedule filled with late night games. Take a walk through early Anchorage history with a guided historical tour of the Anchorage Memorial Park Cemetery, held each year on June 21. The popular free tour stops at the final resting places of famous Alaskans and shares personal stories that shaped the Last Frontier. Many other groups choose solstice weekend for their events as well; so don’t be surprised if you find yourself in the middle of a cookout or swept up in the excitement of a parade. There’s still more sun fun waiting to be discovered; for a complete list of events timed with the longest days of summer, check out the calendar of events.